Author and coach Corey Jahnke talks tips, pitfalls and the successful way to write a book. How Much Time Does Writing a Book Take? 00:00 Corey Jahnke: Well, that’s not really what you want. What you want to do, be, and have is the richest, and that’s why you and I are friends because you concentrate on rich in terms of all areas of life. And one of the things that you gotta do if you wanna become rich in your relationships, rich in your self-respect, and rich in your circumstances is to really go ahead and focus on who you are and create a blueprint and a game plan for becoming the best of who you could be. 00:30 Beau Henderson: Hey, you said that so well, Corey, I think you should be my sub if I were to need to take a day off. That was RichLife stuff right there, that’s right. 00:38 Corey Jahnke: No one can stand in for the great Beau Henderson, but one of the things that has aided me in my journey is my friendship with you because you’ve really helped me understand that life is about who we are, and not necessarily what we own. 00:53 Beau Henderson: There you go. Now, one of the things that comes up over and over again is people saying they have a story, they have a mission, they have a message, and a survey done that I read about somewhere in a publication recently, actually, said that it was something close to 80% of people actually said they had a book they wanted to write, or they wanted to author a book. And I know that’s something you’ve done and it’s something I’ve done a few times, and I know there’s a lot of lessons we’ve learned in that process. Is that something you can teach our people, how to actually more effectively do that? 01:27 Corey Jahnke: Oh, yeah. My favorite topic is “How do I write a book? How do I market a book? And how do I publish a book?” And almost everybody puts it in the wrong order. And I was desperate at one time because I was so stressed out and I was so worked up about my situation and circumstances, I wanted out! And I thought the way to get out was to become a writer, a speaker, and a coach, and I wanted to do that like yesterday. And what I did is I invested thousands of dollars needlessly, I wasted hundreds of hours doing the wrong things in the wrong order, listening to the wrong people, and I want to keep your listeners from doing that. Wouldn’t that be fun for us to set as a goal for today? 02:14 Beau Henderson: That would be an amazing goal! And you bring up a good point. I’ve seen so many times, it’s so easy just to add another course and do another course when sometimes what you need to do is just go out and build your book, but you need some structure to do that, so let’s do it, Corey. 02:32 Corey Jahnke: Where do we start? 02:33 Beau Henderson: Well, one of the big things that I messed up on was, I saw that if I wrote this book, that I could just sit there and wait for the world to come and make it a bestseller. And guess what? No one came. 02:47 Corey Jahnke: Yeah, secret number one. I’m gonna jump in, I don’t want to take away anything. Secret number one: Writing a book is not the hard part. The hard part is letting the world know that you have a book and getting it in front of people. 03:01 Beau Henderson: Right. And you know what I think is the first, first step that you should do before you even consider writing a book? 03:08 Corey Jahnke: What’s that? 03:09 Beau Henderson: Is develop an audience. 03:12 Corey Jahnke: I like that. So many people do it the opposite; they write the book to draw an audience, but tell us why that would be important, to have an audience when you actually release a book? 03:20 Beau Henderson: Because otherwise you’re releasing a book to the cricket. You’re releasing a book to no one. And you think that your Facebook friends and your Twitter friends, and even your relatives are gonna go out and buy that book to support you. And I’m gonna tell you a secret: Even though they care about you and they want you to do well, studies have shown time and time again that most of your social media audience won’t take action. Studies show time and time again that even your relatives and your closest friends won’t reach into their wallets to buy your book for one of two reasons: Either they need the money themselves, or two, most likely, people are procrastinators, and you just about have to hit the buttons for them unless they are part of your tribe, and you know that your tribe is the one that can go ahead and really meet your goals with your book, and help you design that book, and help you write a book that people care about if you create this tribe in the first place and you set up a message that they care about. 04:35 Beau Henderson: Corey, I have a real live testimonial to this tip. One thing I did and some mistakes I made, I had launched three books. Now, I launched them pretty well. They hit the number one thing on Amazon and all this and that, but when I launched them through a big push campaign, and then there was nobody to help sustain that launch, or I didn’t have a backend for people to engage with me further, I just had some good launches, and that was it. But over the last eight years, by slowly growing an audience, this last time we launched the RichLife book, we had… It kinda blew my mind. We sold over 15,000 books since July. 05:16 Corey Jahnke: Isn’t that amazing? And by the way, congratulations to you. You deserve that. 05:19 Beau Henderson: Oh, thank you, Corey. 05:22 Corey Jahnke: And think about not only did you sell 15,000 books, that’s 15,000 lives you’ve probably changed for the better. 05:29 Beau Henderson: At least, I’ve gotten the message in front of them, and that’s really the goal, and I think that should be our goal with the book. 05:35 Corey Jahnke: Well, exactly. Some people think that when they write a book, it’s going to make them a millionaire. The book is not going to make you a millionaire any more than your chances of winning the lottery are going to make you a millionaire. What your book is, it’s your calling card; it’s your… How do you wanna say, it’s your handshake. 05:57 Beau Henderson: What you have to do is, you have to be able to use the book in such a way that it creates a platform. And I know you’re familiar with the platform. Would you like to describe the platform for your listeners? 06:12 Corey Jahnke: Sure. So, with the platform, what that means is what we talked about, it’s great to have a book, and you can have the best book in the world, the best mission, the best idea, something that could literally change people’s lives, but if you don’t have a way to distribute it and get it in front of people, then again it’s not… You’re kind of limited. You’re kind of stuck there maybe with a garage full of books if you bought hard copies. 06:37 Corey Jahnke: But the platform idea is things about, “What are things I can do to leverage my message so that it’s more than one-on-one?” I don’t wanna take away, one-on-one is a great way to get to know and communicate with people. I never think you take that off the table, but could we speak to bigger groups of people about my message? 06:56 Corey Jahnke: Could I do a podcast like we’re doing here and thousands of people hear about the message or radio show? Same kind of thing. Can I have a presence on social media that I’m adding so much value to people that by the time I have something that comes out like a book, they’re ready to grab it because I’ve been adding value all along even when I didn’t have something to sell? 07:21 Beau Henderson: Exactly. And the reason that most people don’t develop a platform is fear. They put the book together and then when it comes to showing it to people, getting people to read it, most people are afraid of the reaction. So, consequently, they become quiet about their own book. They become quiet about their own message, and they don’t seek to develop it further into courses, into podcast, into interviews and articles. Why do you think that is? 07:54 Corey Jahnke: You know, I think it’s a fear of by putting it out there, you’re vulnerable for somebody not to like it. 08:01 Corey Jahnke: And I agree totally and you know what, Beau? No matter who you are, no matter what book you write, I’m gonna guarantee you of one fact; lots of people aren’t gonna like it. 08:12 Beau Henderon: Well, that is another point to bring up with that, Corey. If you don’t have… I actually had to get to the point because I like… You know, I like to make… I like to help people and I like people to love my message or my life’s work so to speak, but I came to the realization that if there’s not people that are on both sides and have different opinions about the book when you’ve probably written something so general and so bland that it’s not really gonna go very far. 08:42 Corey Jahnke: Exactly. You have to actually repel people in order to attract your specific audience, which leads me to the most important part of actually writing your book, which is your avatar. You know what that word means, don’t you? 09:01 Corey Jahnke: So, when I got clear on the fact that I was writing the book called ‘The Successful Thinker’ for Cynthia who is a middle-aged leader who is struggling with the influence. She is trying to raise her three kids. She is trying to solidify the relationship with her husband. She is having a little trouble with her… Really hard time getting her team on board with her programs. When I got clear that that’s who I was writing for, my writing improved significantly, and the number of books that I’ve sold has improved dramatically. Wouldn’t you say that ‘The RichLife’ has a specific target in mind? 09:44 Beau Henderson: Yes. And that’s something I think is key or another way to say this, “Clarity is key” because when you’re trying to make your message off things to all people, it’s really hard to connect with anyone. But something I found, Corey, is when I realized that ‘The RichLife’ message really connected with young business owners that were raising families and trying to balance business and family life and health and all the things we talk about in The RichLife Show, when I got crystal clear on that, I started attracting other people around that avatar because I had a pinpoint that was so clear. People could really connect and resonate with it. 10:30 Corey Jahnke: Exactly. And the other thing that it does when you’re that clear is you realize that if I don’t push this book as hard as I can, and the supporting programs and courses, what I’m doing is I’m stealing from Cynthia or your avatar, you’re stealing from those people a message that they desperately need and they desperately wanna have. So, you’re stealing from them if you allow fear and overwhelm and guilt and self doubt to keep you from really forwarding your message. Wouldn’t you agree? 11:15 Corey Jahnke: Oh, that’s so good. 11:17 Beau Henderson: That’s right. It’s about the people that hopefully this message that lights us up is meant to impact. 11:24 Corey Jahnke: Right. Because at the end of your life, you’re gonna ask yourself a question, “What difference did I make?” Someone that we both follow, a guy called Brendon Burchard says, “At the end of your life, you’re gonna ask yourself three questions. Did I live? Did I love? And did I matter?” And the only way you can really matter is if you put full force energy into everything that you do and everything that you are. And the best way to matter to your audience is to really, really connect with them and to really, really seek to serve them. 12:01 Beau Henderson: That’s right. 12:02 Corey Jahnke: I know that you and I are great believers in the concept that you’re successful to the degree that you create value for others. In order to do that, you really gotta get clear on who those others are. Don’t you think? 12:15 Beau Henderson: Absolutely. You gotta get crystal clear to know how to serve them. Another thing that point brings up, Corey, is this idea of… Yeah, we said it’s not about you, but when you have something that you define, that’s bigger than you or that’s outside of you, that you’ve also agreed with yourself in a conversation with yourself, that is important to you and that matters to you. Even to take it stronger, call it a mission or a legacy. Having that thing outside of you that’s bigger than you, it makes it easier to make decisions, right? Because it’s about, am I doing things because I don’t feel like it today, or because I’m tired, or because I got rejected on my last call? Or am I doing it because it’s gonna move this message or this mission forward? 13:55 Corey Jahnke: Yeah, I really do. I really think that if I were to do it over again, what I would do is, I would dedicate my first year to building what’s called an e-mail list. And for those who aren’t familiar with e-mail lists, what an e-mail list is, is it’s the people that you have on your list that are actually interested in the message that you have to offer, enough to the point that they’re willing to open your e-mails and listen to the things that you say to them. The value that you’re giving them. And so, what most people should do is they should find an inexpensive e-mail marketing company like Mail Chimp or Aweber, and then create a way for people to sign up for something that gives those people an idea of the value that you have to offer. So, that might mean writing a give away article or a give away white paper or even a few videos that say, “Hey, this is who I am. This is what I’ve got. Are you interested?” And not everybody will be interested, but what you can do is you can develop a group of people who you’re starting a relationship with who can then go ahead and care when you actually produce that book. The other thing that they can do is they can help you write the book because you can ask these people questions. And they can help you really get clear on the book that you’re writing. I think all too often, people write the book they wanna write instead of writing the book others wanna read. Wouldn’t you say that’s true? 15:38 Beau Henderson: That is absolutely true, and I think the key too that we’re bringing up is, I agree, I think a successful book campaign, you need to give it a good year. I’ve seen scenarios of nine months, but it can be very stressful to do that. So, say you give it a year, Corey. Now, if you take a year to write your book, then you go lay your foundation, that’s two years. You can’t… You need to be outlining your book as a starting point, and then like you said, communicating with these people that acutally… They’re gonna be your fans, your friends, your supporters, the buyer of your book, and they’ll actually help you write it as you go. It’s gotta be mapped out very… There’s a lot of moving parts here. 16:25 Corey Jahnke: There is, but the big key, and I think that so many people forget this, is you wanna have fun doing it. I think that if you can go ahead and create relationships with your audience, the same way that you would create relationships with your friends, it can really be fulfilling and sustaining. You have to realize that most people are out there suffering and struggling just to get by. And if you and I are out there offering them a glimmer of hope and a glimmer of inspiration and a glimmer of optimism and so forth, it’s amazing what you can do to generate excitement out there. I know you do that on a daily basis. 18:03 Corey Jahnke: Think of it this way; my content, say it’s eight chapters. That’s the eight modules of my course, that’s the eight key topics that I’m gonna choose from for my speech, etcetera, etcetera, and you utilize that and that’s how you really get a message to the world. You’ve got to hit them with that message in as many ways as you possibly can. 18:26 Beau Henderson: Oh yeah. It’s so important to realize that as you’re rolling out your book, you’re sharing pieces of your book with your audience and you’re sharing pieces of your course with your audience. And what you’re able to do is you’re able to let them help you get excited about it, you’re able to let them help you refine it and then you know what happens? A really cool concept of economics is that people will support what they help create. 18:55 Corey Jahnke: There you go. That’s right. They have some skin in that, they’ve bought in more or less. 19:00 Beau Henderson: Yeah. They say, “He put out the survey and this is what I said and I think he took some of what I said,” and now all of a sudden they’re not a RichLife audience, they’re RichLife zealots. 19:12 Corey Jahnke: There you go. You create an active community. 19:16 Beau Henderson: Yeah. And that’s the kind of thing that’s gonna sustain you, because now we’ve spent a year creating an audience, we’ve spent a year writing a book and now we’re gonna spend the rest of our lives marketing it. But one of the things that people don’t understand is that you don’t have to write a whole library. Think about Stephen Covey and the book the ‘7 Habits of Highly Effective People.’ He promoted, pushed, and did everything around that book for 15 years before he came out with the eighth habit. 19:50 Beau Henderson: You can really, really do a lot with a small message. Because one of the things that we know is that there’s only so much time for you and there’s only so much time for your audience. So, a smaller message defined really, really well is 10 times more powerful than a huge message defined poorly. Wouldn’t you agree? 20:10 Corey Jahnke: 100% agree. And a lot of times, especially if your goal is to create this community that doesn’t just have a one way conversation with you, but that you actually facilitate them having conversations with each other, what I see, it’s a very… A lot of times a smaller book with maybe just a handful of principles or tenets or behavior things to do that the community rallies around. So, sometimes I do think smaller is better and maybe that might even be a really good goal for your first one. Maybe shoot for 100 page book, not your 250 page opus, you know? 20:51 Beau Henderson: Yeah. Exactly, because it’s… The hardest part of the whole process really is hitting publish and saying, “You know what? This is as good as I can do for my first book.” And just getting the courage to put your book in front of other people, is major for most people. 21:13 Corey Jahnke: And here’s something I wanna say is, make sure you write about something you believe in. Don’t write about something somebody thinks you should write about over dinner unless it’s something that lights you up. But once you write that book, sure it may need a second edition, I can tell you all about that, it may need edits, and it maybe a work in progress, but write in something you believe in and then believe in what you write. Ooh tweet that one Corey, that’s a good one. 21:44 Beau Henderson: That’s a great one, because the thing about writing, and I said this to one of my really good friends, is the thing about writing is, it’s amazing because writing helps me get really clear on what I believe. 21:57 Corey Jahnke: Yep, very good. 21:58 Beau Henderson: So Corey we were talking about all these pieces now, we don’t have time to dig into all the moving parts. There’s someone out there, it’s 80% of the people out there from what we’ve heard, they have that book and they say, “You know what? I’m gonna make the next year the time I actually get that book out there. I’ve been talking about it for 10, 15 years, maybe longer, but I’m gonna do the book the next year.” Where do people go to start? Because for me I would want some kind of a game plan or a business plan to do what we’re talking about doing. 22:33 Corey Jahnke: Okay. So what we can do is, I’ll create a webpage and it’ll be called CoreyJahnke.com/blueprint. And I’ll make a three part video series that’ll be a blueprint for how to market, write and publish your book on a budget. One of the things that I really don’t want your RichLife readers to do is, to go ahead and spend a ton of money doing the wrong things the wrong way like I did. So I’ll go ahead and create that video series and have it up by the time this program airs. 23:08 Beau Henderson: Thank you so much Corey. So you’re gonna help us do what you and I have done over the years. We’ve learned a lot of things by trial and error. Now, won’t it be nice just to have, even if it’s a one page outline of here’s the steps and here’s the order to do things? So you’re not wondering and you’re not kind of shooting in the dark hoping you pulled together the right team and you have the right order. That is priceless my friend and that’s gonna make a lot of our listener’s lives just a little richer by having that resource. Thank you so much. 23:37 Corey Jahnke: Anytime. And you’re right. What I’ll do is, I’ll create three short videos and then I’ll give them a downloadable outline as to where they should start. 23:45 Beau Henderson: Well, it wouldn’t be right unless as we take this show out, you let us know, Corey, what it is that makes your life rich. 23:56 Corey Jahnke: Friends like Beau Henderson, a wonderful marriage to a super supportive lady, and a daily commitment to optimism and happiness. 24:09 Beau Henderson: Now, that sounds like a good definition of a rich life. RichLifers, you can go to the richlifeshow.com and you can get the information about Coreys’ offer to give you the blueprint to write your book. And go out today and be thankful for the things in your life that make your life rich, and I’ll see you next time. Same place, right here on the RichLife Show. 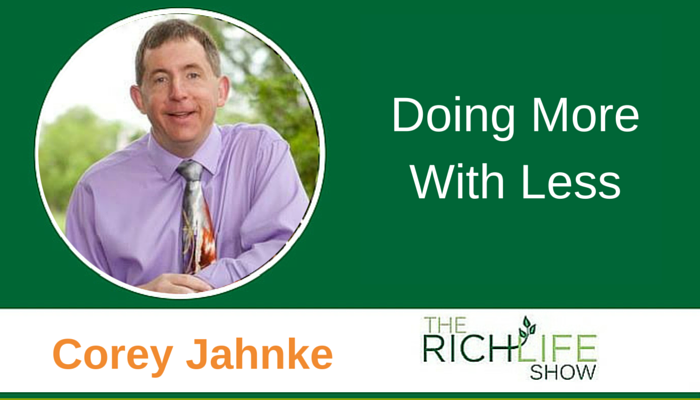 Corey Jahnke is a world class business and success coach! Corey has been working in customer service since he was 9 years old (37 years). Corey has been certified as a speaker/trainer/coach by John C. Maxwell (the world’s foremost leadership guru) and Bob Burg’s Go-Giver Coaching team. Corey is an avid student of personal development. Corey has read several hundred books and articles and listened to thousands of hours of educational audio materials on the subjects of business and personal success. Corey’s favorite authors and thought leaders are Brian Tracy, Darren Hardy, Harvey Mackay, John C. Maxwell, Bob Burg, Jeffrey Gitomer, Jim Rohn, Orison Swett Marden, and Napoleon Hill. Corey’s ground breaking book “We Are Not Here On Rehearsal” was the culmination of Corey’s work with hundreds of thousands of one on one customer interactions in his 25 year career as a community pharmacist!! Corey has dedicated his efforts recently to his Ultimate Customer Creation Machine project. Corey’s simple yet powerful customer care philosophies have made Corey an award winning business person who can help you take all of your endeavors and create amazing successes with them.